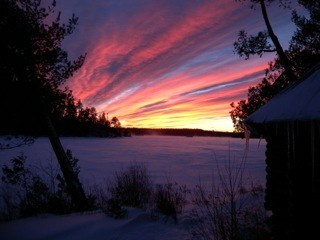 You are here: Home / Blog / Ski and Snowshoe in Maine Wilderness! Ski and Snowshoe in Maine Wilderness! Join long-time trip leader Patti Polinsky for a fully-supported winter break getaway in spectacular Maine wilderness. Families are welcome! Escape to the tranquility of mountain lakes, flowing rivers, and spectacular waterfalls in lovely untouched Maine wilderness on this Mountaineers Global Adventure over winter break (Feb 15-21, 2015) with Patti Polinsky, veteran leader of decades of fun and successful domestic and international adventures! With Portland, Maine, as a home-base, shuttle to XC ski or snowshoe between traditional Maine sporting camps coordinated by Appalachian Mountain Club. Stay at each camp for 1 to 3 nights to enjoy XC skiing and snow shoeing on groomed trails, rated from moderate to strenuous. Explore local points of interest including Gulf Hagas, the Grand Canyon of Maine. See moose, deer, red fox or their signs in the snow. After a day of activity, relax in the wood-fired sauna or wash away sore muscles in a hot shower before a wonderful bountiful dinner. Then retire to your cabin or bunk house to sit beside the wood stove and read before retiring. Distances are 0.5-8.6 miles between lodges. Gear is shuttled so you only need a day pack. Families with children 10 years + are welcome! To get more information about this fantastic winter-break get-away, visit the event page or email Patti at meanysports@me.com.